Tony Penna Sr. watched children play with sports equipment, throwing frisbees, jumping rope and making crafts at the Wood Street playground on June 13, during the first night of a three-month summer “Playground Takeover” at the Hornerstown playground organized by his Coaches 4 Kids Foundation and the Goodwill Industries’ GoodGuides youth mentoring program. 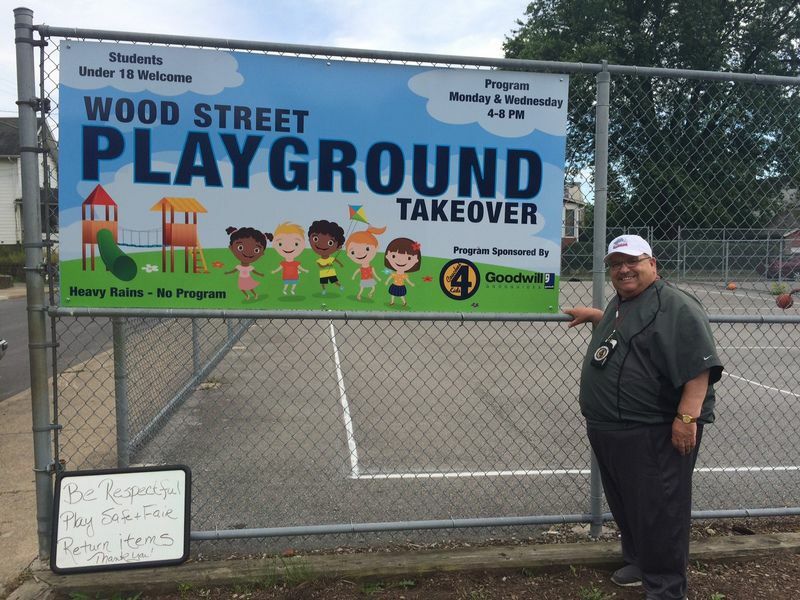 Submitted photo: Tony Penna, Sr. of Ferndale stands next to a sign promoting the “Wood Street Playground Takeover” summer activity program for kids, sponsored by the Coaches 4 Kids Foundation and Goodwill Industries’ GoodGuides Youth Mentoring Program. The “Playground Takeover” is one of at least five projects Penna is working on through his foundation to benefit children in Cambria and Somerset counties. The “Playground Takeover” is just one of at least five “dream projects” Penna is taking on through Coaches 4 Kids, a nonprofit foundation the retired high school accounting teacher and coach established in 2013 to provide athletic, recreational and educational opportunities for children in Cambria and Somerset counties. Each Monday and Wednesday evening from June through August, Coaches 4 Kids and Goodwill GoodGuides are offering four hours of age-appropriate activities from 4 to 8 p.m. at the Wood Street playground, including sports and yard games, arts and crafts, dance and music. The activity is free to all children of the community younger than 18 years of age. As the summer progresses, Penna said they hope to add guest speakers and special activities such as ice cream sundae or pizza night events into the weekly schedule. He also hopes to expand the “Playground Takeover” program to several more playgrounds in the coming years, with a goal of making it a city-wide summer activity in the future. As Penna mulled over the idea for his foundation three years ago, he thought of the Dale Borough Municipal Field where he learned to play ball, and how it taught him and other kids in his community those character qualities that helped them succeed in life, including sportsmanship, teamwork and leadership skills. That field became unused and overgrown in later years, but the 67-year-old Ferndale resident has plans to bring it back to life again with a four-phase renovation project. The first phase is scheduled to start in July; under Penna’s leadership, Coaches 4 Kids received approval from Dale Borough council to bring in the U.S. Army Corps of Engineers to clear the land and build a baseball and a softball field as well as dugouts. Hopefully, this phase will be completed so that those ballfields can be used next spring, Penna said. The second and third phases entail building soccer and football fields, a basketball court, a handicapped-accessible playground, picnic tables and pavilions and a walking trail around the property. The fourth phase would build a field house to allow for indoor sports activities during the winter months, and provide office space for the Coaches 4 Kids Foundation. The organization is enlisting the help of experienced grant writers to work on getting funding for these three segments of the project. “Our real dream is to have an indoor playground for people and kids to play in the winter, and run all my camps there,” Penna said. Right now, he is working out of his old coach’s office at the Greater Johnstown Career and Technology Center and is working with the school to rehabilitate its former baseball field, which was named after Penna, and put it back into use. Earlier this year, Coaches 4 Kids Foundation launched an Entrepreneurship Academy for high school students at the Greater Johnstown Career and Technology Center. More than 300 students from the school’s seven sending school districts learned about writing a business plan and running a business with the help of guest speakers and the BizKid$ video series. This activity was offered to the students at no cost to the school, through grants provided by the Community Foundation for the Alleghenies, the Fenn Foundation and Walmart. Penna said that Coaches 4 Kids has already received a grant from Lee Initiatives to offer the Entrepreneurship Academy again next year at the Greater Johnstown Career and Technology Center. Coaches 4 Kids also works with the Alternative Community Resource Program to offer summer sports camps (in football, basketball, baseball/softball and golf) during June and July, for boys and girls in the third through eighth grades. This program is growing as well, Penna said, mentioning that more than 100 football players and 15 golfers were among last year’s participants. More information on these summer sports camps or any of the Coaches 4 Kids programs is available by contacting Penna at 814-288-9311 or visiting Coaches 4 Kids’ website at www.coaches4kids.org. In addition to fundraising through grant applications, Coaches 4 Kids participates in Chillin’ for Charity, held in February at the Quemahoning Family Recreation Area, sponsors a golf tournament in June and has a Christmas Cash Giveaway in December.